With styling influenced by the GSX-S1000, but with its own aggressive turn, the GSX-S750’s new bodywork looks wild and forceful, yet keeps the rider comfortable at all times. The new headlight nacelle houses provides a visual focal point while the under cowl connects the chassis styling to the engine and new exhaust system. Frame design combines the advantages of a compact tubular-style street bike frame and a twin-spar sportbike frame to deliver a dynamic ride. A reasonable sport riding position is created by a carefully crafted relationship between the handlebars, footrests and seat. New, large-diameter, matter-black tapered handlebars damp vibration while adding style and good control leverage for the rider. The low seat height of 820 mm (32.2 in.) contributes to the sporty, yet upright riding position and aids rider confidence at stops. New, four-piston Nissin Monobloc brake calipers squeeze twin, 310mm wave style brake rotors up front with a single-piston rear caliper out back to help deliver controlled stops. New inverted, gold-anodized KYB fork features a spring preload-adjustable design which provides a solid foundation for the new, radial mount brake calipers. New, trapezoidal, beam-type swingarm tapers down to new chain adjusters adding strength and style. Link-type rear suspension, with a single shock absorber working through a progressive linkage, has 7-way adjustable spring preload. Newly designed, 10-spoke cast aluminum wheels from TPR hold Bridgestone Battleax Hypersport S21 radial tires that deliver increased grip and stability. New, black finish, aluminum hand and foot controls provide excellent action and contribute to the motorcycle’s sporty style. This new GSX-S750 is equipped with Suzuki’s Easy-start System that requires just a simple touch of the starter button to fire up the engine (without pulling the clutch lever if the transmission is in neutral). Distinctively shaped headlight nacelle contains a bright 60/55W H4 halogen bulb. The tail section houses an integrated LED taillight with a dual-pane, red/clear lens. Similar to the GSX-S1000, the new lightweight and compact instrument panel uses a LCD display that includes speedometer, tachometer, odometer, dual tripmeters, gear position, coolant temperatures, driving range, average fuel consumption, instantaneous fuel consumption, traction control, and a clock functions. The display has an adjustable intensity, white-color backlight for great nighttime visibility and is flanked by LED indicators for the turn signals, high beam, malfunction, traction control, ABS, plus coolant temperature and oil pressure alerts. Potent 749cc 4-cylinder fuel-injected engine uses 2005 GSX-R750 architecture so the power delivery is an excellent bled of strong low-end and a muscular top end. Using the K5 generation GSX-R engine architecture also permits a shorter chassis which greatly enhances handling. 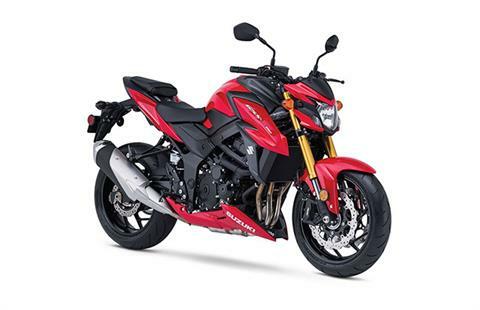 This also makes the GSX-S750 the only motorcycle in its class with an engine with SuperSport lineage. Ventilation holes are added to the bottom side of each cylinder in the GSX-S750’s crankcase. The holes reduce pumping loss to help produce power and gain fuel economy. Camshafts tuned specifically for the GSX-S750 deliver a dynamic wave of smooth torque and strong acceleration. 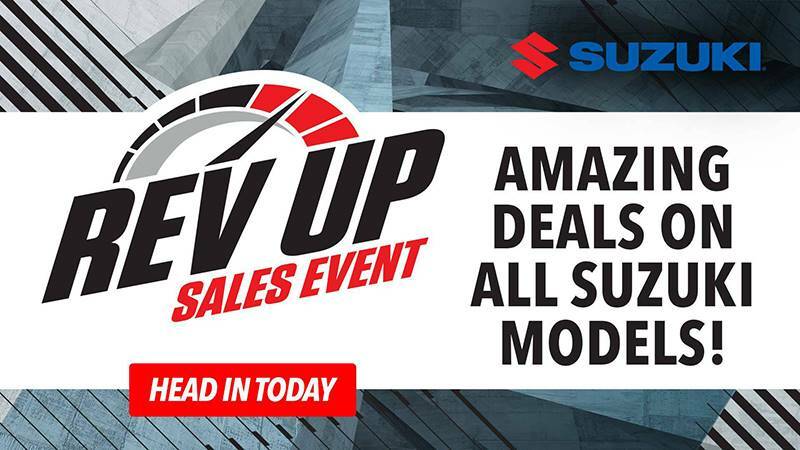 Throttle bodies with Suzuki Dual Throttle Valve (SDTV) system contribute to better throttle response and torque at the low-to-mid RPM range, while still producing peak performance. New, ten-hole, long-nose fuel injectors deliver finer atomized fuel to increase combustion efficiency. 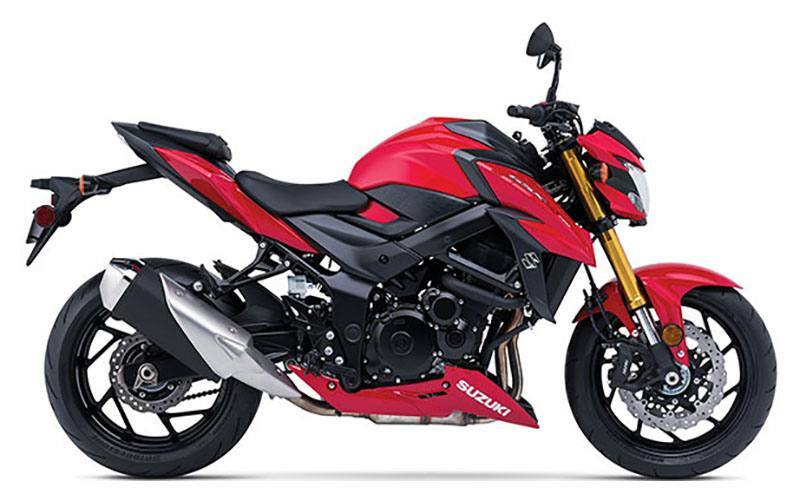 The TI-ISC on the GSX-S750 has Suzuki’s Low RPM Assist feature that seamlessly adjusts engine speed during take-off and low-speed riding to smooth the power delivery and to help reduce the possibility of the rider stalling the motorcycle. 6 A new, larger capacity air box is required to match the higher engine output. The air inlets have been designed to provide an exciting auditory experience. The Engine Control Module (ECM) provides state-of-the-art engine management and has enhanced settings to suit the intake and exhaust systems, resulting in linear throttle response and class-leading fuel economy. 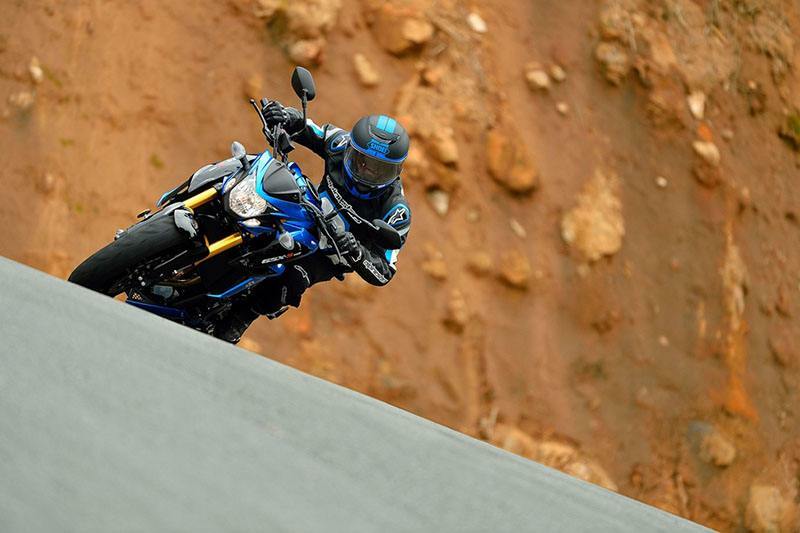 Suzuki’s advanced traction control system* lets the GSX-S750 rider control the throttle with more confidence in various riding conditions. As a result, the rider can enjoy sport riding with less anxiety. There are four traction control modes (1, 2, 3, and OFF) that the rider can easily adjust at rest or on-the-fly via a handlebar-mounted control. The difference between the modes are their sensitivity to road conditions. Mode 1 is lowest sensitivity level most suitable for skilled riders or in conditions that have good road surface grip (sport riding on good, smooth roads). Mode 2 is a moderate sensitivity level that is suitable for most riders or in conditions that have varied road surface grip (city riding, regular road conditions). Mode 3 is highest sensitivity level suitable for road conditions where the grip may be limited (wet or cold surfaces). OFF disengages all traction control features. The fresh-design stainless-steel, 4-2-1 exhaust system helps the engine deliver a strong low-to-mid range punch with an exciting rush to redline. A larger catalyzer is in the mid-pipe to assist in emissions control without sacrificing performance. Angular radiator shrouds efficiently guide cooling air to the high-capacity radiator. Additional heat is removed from the engine via the use of a lightweight and compact liquid-cooled oil cooler (like those used on GSX-R models). New fuel-injected, 749cc, 4-cylinder engine uses GSX-R architecture to deliver a torque-rich sportbike experience. The new front Nissin Monobloc brake calipers and twin, wave style brake rotors supply strong and consistent braking performance. Aggressive styling, with cues from the renowned GSX-S1000, surround an ergonomically comfortable, yet sporty riding position. The shorter final gear ratio enables the new GSX-S750 accelerate quicker than the prior model while the additional engine power maintains the same top speed potential. Large diameter, wet multi-plate clutch is derived from a GSX-R750 design to easily transmit power while the rack and pinion clutch release provides the rider with superb friction-point feel.